Jason William Brown, 35, made an appearance in Surrey provincial court Monday and was remanded in custody until Dec. 2.His co-accused, Terra Lyn George, 24,was ordered released on $10,000 bail by Judge Jean Lytwyn, who is also presiding over the gun trial of Red Scorpion brothers Jamie and Jarrod Bacon.Abbotsford Police Const. Ian MacDonald said Monday that Brown was picked up at a Langley residence Saturday night after a four-day search by authorities.The one-time Hells Angel associate was charged Nov. 17 with two counts of possession for the purpose of trafficking, as well as possession of a restricted weapon and possession of a firearm while prohibited.When Abbotsford’s drug section raided Brown’s Aldergrove rental house five days earlier, they said they found two kilograms of cocaine with a value of $80,000, about a kilo of methamphetamine with a value of $25,000, a 9-mm handgun, a loaded magazine, boxes of ammunition, two bullet-proof vests, Red Scorpion paraphernalia and about $12,000 cash.While police now consider Brown to be a Red Scorpion, he was arrested in 2005 as a Hells Angel associate in the massive undercover operation targeting the East End Chapter of the notorious biker club. 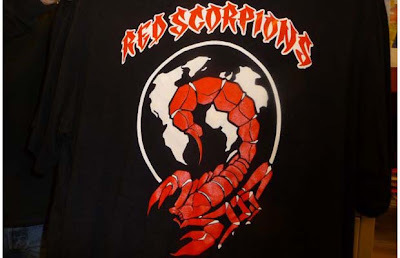 0 Response to "police consider Jason Brown to be a Red Scorpion, he was arrested in 2005 as a Hells Angel associate targeting the E"